SolarEdge Technologies, Inc. (“SolarEdge”) (NASDAQ: SEDG), a global leader in PV inverters, power optimizers, and module-level monitoring services, is presenting its commercial PV solution and expanded smart energy management portfolio at Intersolar. The expanded smart energy management portfolio includes a new product suite of load switching devices and immersion heater controls designed to direct excess PV energy to appliances during the day in order to shift energy consumption to match PV generation. Also as part of the smart energy management portfolio expansion, is the addition of LG Chem’s RESU10H battery and RESU7H batteries to StorEdge™ solution compatibility. 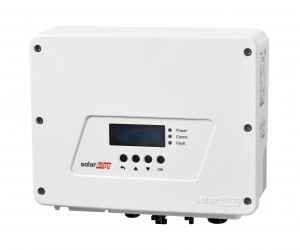 SolarEdge is also presenting its commercial offering and HD-Wave technology inverter at Intersolar. Its commercial offering features a new extended service suite that supports PV business throughout the life cycle of commercial PV systems. With its HD-Wave technology inverter being ≤6kW, ≤9.5kg, having 99% efficiency and excellent reliability, the technology makes a leap for inverters. SolarEdge’s HD-Wave inverter technology is listed as a finalist for the Intersolar Awards in the photovoltaics category. Intersolar Europe attendees are invited to visit the SolarEdge booth, located at Hall B3, booth 110, to meet its local and global management teams, learn more about its new product offerings, participate in daily trainings, and provide feedback.